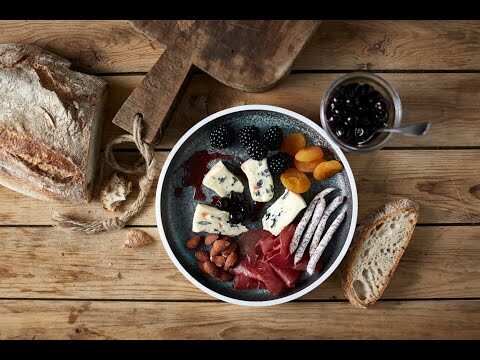 Arranged like a canvas of vibrant tastes – our recipe for blue cheese with nuts, bresaola, sausages, fruits and berries shares close resemblance to that of a beautiful painting. Take advantage of the effortless preparation and enjoy as a starter or for lunch. 2. Cut the cheese into slices and arrange with the nuts and cherries on four plates. 3. Distribute the blackberries, sun-dried apricots, snack sausages and bresaola on the plates. 4. Arrange and serve with sourdough bread.